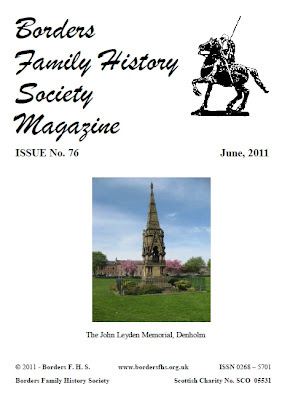 Lauderdale, a notice about Stirling University Conference - Monuments and Monumentality in Later-Mediaeval and Early Modern Europe, articles on the life of Dr. John Leyden, Maps as Historical Sources, Arrangements for a Victorian Wedding, examples of records at the Hawick Heritage Hub, Bi-gen Blogspot, Kelso Mail Marriage entries between 1808 and 1823, the Black Dwarf (at Manor, Peebleshire), some epitaphs written by Robert Burns; as well as details of new members and their interests. The magazine was despatched to members on 29th June. If you haven't received your magazine within a reasonable time, please let us know on the Contacts page as soon as possible, selecting the 'Magazine Non-Arrival' contact type, and specifying your full name, email address and postal address. Due to the labour dispute at Canada Post, we understand there is a backlog of mail, so Canadian members may experience additional delays before receiving their June 2011 magazine.